First off I have to mention the cover art for this book. The stylized “E” is absolutely stunning. It is perfect. It has just the right amount of flair and draws the eye. The gorgeous cover art was created by Patricia A. Doherty. Outpost 3 has survived the attack by Grey and his men. Eden with Miranda’s help reprogrammed the Sentries to follow Matt’s commands. With these robots under his control, Matt now has ultimate power over the residents of Outpost 3. Matt has forced Eden and Miranda to both move into his residence. He wants Eden as a romantic partner, but she does not love him. She is in love with Jonas, but Jonas is angry with her for siding with Matt during the battle. All her personal problems pale in comparison to the fact that by taking over the sentries, they have broken a major world law. Eden knows that the powers-that-be will not let their takeover of the sentries go unpunished. She knows that all the sentries everywhere are linked and that the only way to ensure their total safety is to go to the white tower and somehow disable all the sentries in existence. To do that she would have to find the city, enter the white tower and somehow shut down every sentry in existence. She also knows that Matt will never allow her to leave Outpost Three to test her theory. Now what? How is Eden going to escape being erased again? What about her friends? How will she save them? Does Matt have a plan? Will she find a way to get to the tower? Or is this the end for all of them? Dystopian fiction is a genre that is cluttered with a multitude of titles. Some are good. Some are bad. Some are just ok. But, there are a few that are GREAT. This book as well as the first book in the E Series both fall solidly into the great category. What is so great about these books? Well, there are several things that make me love the writing of Kate Wrath. Firstly, although this is a young adult novel and the main character is female, she is not a simpering idiot. She does not have romance as the driving force in her life. Eden is much more focused on survival and on how to escape the Outpost. Also, she is loyal. Too often in novels we see the characters shifting their allegiances constantly. Though it may not look like it at times, Eden is steadfast in her loyalty to her friends. Thirdly, Kate Wrath’s world building is terrific and readers are constantly discovering more and more about what the world is like and why. I like the fact that not all the information was doled out immediately. It is much more realistic for the reader to discover the world at the same time that Eden does. I know I mentioned above that romance is not Eden’s driving force and that is true, but that does not mean that there is no romance. It just isn’t the main focus. It is much more believable for someone who is struggling daily just to stay alive to focus on that survival first and foremost. By portraying the romance as slow to develop it draws the reader in and makes them more invested in the ultimate outcome. Youth is often a time of confusion and conflicted feelings. 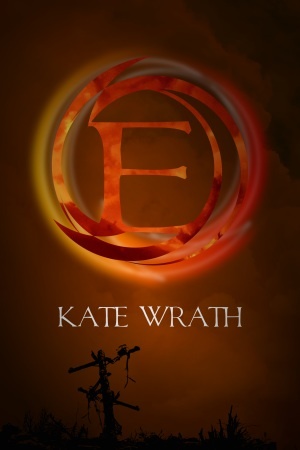 Kate Wrath expertly navigates through these emotions. 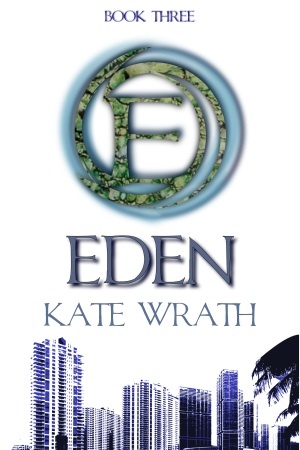 As Eden spends more time with Matt, the reader can clearly see that her feelings for him evolve. The juxtaposition of head and heart telling her opposite things is very realistic. And what about her feelings for Jonas and their shared past? Eden is as confused as any teenager; it’s just that her feelings have to take a back seat to her survival. Probably my favorite thing about Kate Wrath’s books is their unpredictability. Just when the reader thinks they have the plot all figured out, a new twist or obstacle arises and the story takes yet another unexpected turn. I LOVE THIS! I love not being sure what will happen next. Predictability is annoying and greatly reduces the enjoyment of reading a great book. I cannot praise this series highly enough. I want to be surprised, and Kate Wrath continually delivers. Besides the great plot, the amazingly realistic characters and the fact that this book is simply unputdownable, it also contains some amazing technologies. 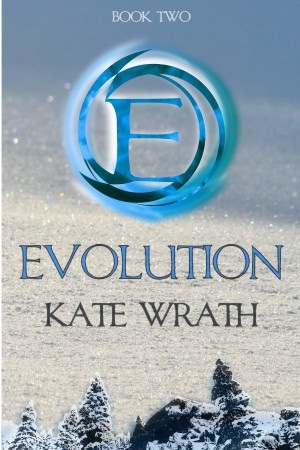 While I have spent most of this reviewing writing about various things I love about EVOLUTION, I have neglected to mention Kate Wrath’s genius when it comes to both world-building and the science-fiction aspects of the book. Not only are there robots that were supposedly programmed generations ago that are still working perfectly, but there is also the entire future world to explore and discover. Her “aether lamps” and “aether traps” are another awesome creation from the mind of Kate Wrath. One of my favorite parts of this book is Matt trying to recreate Christmas at Outpost Three. He doesn’t have any memories of what Christmas should be like, and even the oldest outpost residents have never experienced Christmas. Because books, magazines and newspapers are few and far between, Matt only has a few torn articles and minor book mentions of the holiday to use to recreate Christmas. The result is mixed, which I thought was portrayed perfectly. Imagine seeing pictures of decorated Christmas trees while living in a world where trees only exist outside the outpost and as far as people know, the only uses for trees is either building material or firewood. People would think you had lost your mind if you decorated a tree, and exactly what could you use to decorTe it with? Resources are extremely scarce and most homes are little more than hovels. No one has decorative items. Who could afford them? And why would anyone want to own things whose only use is to look pretty? I think readers will agree that this portion of the book is a great addition to the story. Kate Wrath is quickly becoming one of my new favorite authors. I cannot praise this series highly enough. If you haven’t read “E” yet I suggest you buy it right away. If you have read “E” but haven’t purchased “Evolution” yet, what are you waiting for? Go to Amazon right away or visit the author’s website and buy your copy right away. You will not be disappointed and you’ll be happy you did. 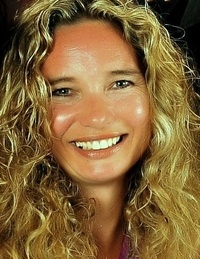 Kate Wrath is the author of the E Series. 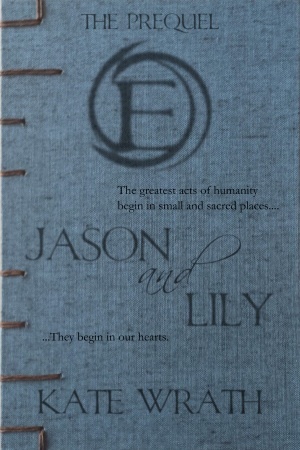 EDEN which is the third book in the series is set to be released on June 13, 2015 and JASON AND LILY – a prequel to E is due to be released on July 23, 2015. 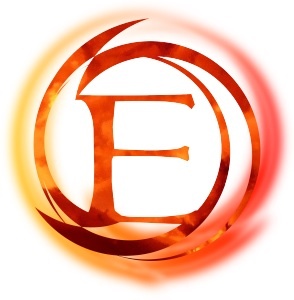 Listeners were introduced to Greco in CROSSFIRE – Book One of the series. Greco is Mirissa’s protector and her trainer. Not much is revealed about his background in the first book, but there are hints given that his childhood was anything but idyllic. In fact, his mother treated him like an unwanted stray dog that she was stuck with. Her drinking only escalated the abuse and Greco has not seen or spoken to her in a very long time. He is very private. He does not often tell people about the abuse he suffered at the hands if his mother. So, when word comes that Greco’s mother has been abducted, he is given the job of tracking her down. 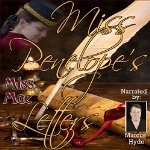 This audiobook is very well written and performed. I am glad that the author chose to use a male narrator to tell Greco’s story. I do not think it would have had the same impact if it was narrated by a woman. 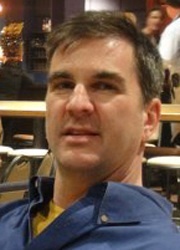 David Dietz has the ability to pull his listeners into the story and to ensure that they keep listening. His pacing is perfect and his suspense building skills are second to none. I rate the narration as 5 out of 5 stars. While the first book focused mostly on Mirissa and on building the plot, this book was much more personal. It does have a terrific mystery that must be solved, but it is the character development and the emotional aspects that make this audiobook a five star listening experience. Born and raised near Toronto, Canada, Andrea Domanski moved south to get away from the snow and cold when she was 24 years old. 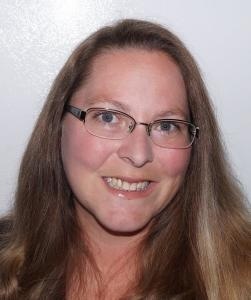 She now lives in Savannah, Georgia with her husband, Mark, their two children, and their Golden Doodle. After selling her business in 2012, Andrea focused her energies on raising her two children and finding a new career path that excited her. It wasn’t long before she decided that writing a novel – something she’d always wanted to do – would be her next big adventure. I was not sure what to expect from this audiobook. The descriptive blurb intrigued me and I decided to give it a chance. I am glad I did. I enjoyed the mixture of genres that are included in this book. This book combines paranormal fiction with science fiction and mystery all in a Young Adult friendly novel. Mirissa Colson’s mother left for work one morning, twelve years ago, and never returned. Now, on Mirissa’s eighteenth birthday, a package arrives from her mother. Mirissa is of course both intrigued and repelled. Does she really want anything from the woman who so callously left her husband and six year old daughter? What Mirissa discovers is that she is not just an average teenager, in fact she is descended from an ancient line of Amazon women and it is her destiny to fight and defeat evil. Mirissa’s gift was an Amazon ring. Her mother sent it to her and now must learn what her powers are and exactly what the ring can do. Of course, no story would be complete without the requisite bad guy. In CROSSFIRE the bad guy is an evil genius. There are battles, teen angst, Amazon warriors, good versus evil elements and of course a budding romance. What more can readers want? 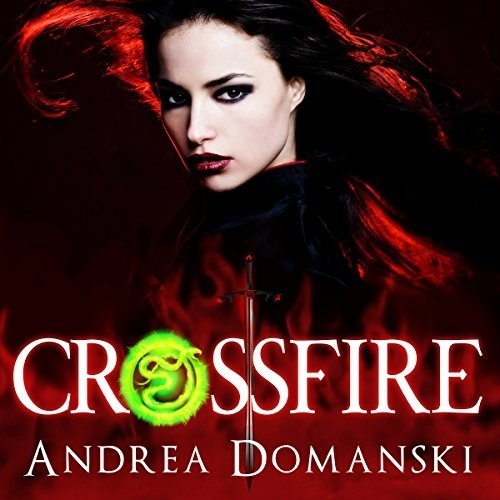 CROSSFIRE is a young adult novel. There are many elements to the story that listeners will enjoy. There is a bad guy who is set to take over the world and it is Mirissa’s destiny to stop him. Melissa Chatwood narrates this book with evident skill. There are a lot of characters in this book and it would have been easy for listeners to become confused, but Melissa navigates through the characters with ease. The listener is able to immerse herself in the story. I give the narration 5 out of 5 stars. Penelope has been hired on as a housekeeper in a wealthy household. She has not been there long when letters begin arriving addressed to her, but unsigned. The letters ask her to meet the sender, but it is always at night and definitely not in the most reputable part of town. Penelope is intrigued (what girl wouldn’t be?) but she is also cautious and skeptical. One brief but amazing kiss has her wondering just what she has gotten herself into. This audiobook is short, but the author manages to pack a lot of story into a brief time. There is mystery, there is romance, there is history and politics and there is lots of intrigue. I enjoyed the fact that the story focused mainly on the mystery aspect and kept the romance aspect to a minimum. Sometimes, less is more as it is with this audiobook. The narrator does a pretty good job of most of the voices in this book, but one voice (the voice of Charlotte) does not seem to match the character. She is supposed to be a fairly young, unmarried woman, but the voice he uses makes her sound the same age as the voice he uses for Charlotte’s mother. But… that is just my opinion. Other than that, I think Marcus Hyde has done a good job with pacing and he speaks clearly which is much appreciated by the listener. DEAD NEW WORLD IS ZOMBIE FICTION AT IT’S FINEST! Ambrose and Stanley are best friends. They also happen to be seventeen years old and have been drafted into the army. The army’s goal is to rid the world of zombies. 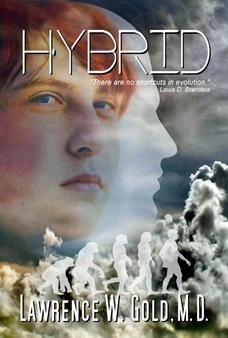 Teenagers are drafted into the army when they come of age and must spend nine years in the army before being released. The catch is that not many people actually survive for their entire nine year tour. While on their first mission Stanley and Ambrose end up as the only survivors of a coordinated attack by The Reverend, his forces and his zombies. But, neither one of them escape unharmed. Stanley loses his leg and Ambrose was bitten by a zombie. Taken to the only functioning hospital still in operation, Stanley recuperates and receives a prosthetic leg. Ambrose is put in quarantine to await his death once he turns into a zombie. But something unusual happens. Ambrose does not turn into a full zombie. He becomes a sort-of half man, half zombie hybrid. As if a world full of zombies weren’t enough, there is a man who calls himself “The Reverend” who plans to take over the country. The Reverend is pure evil. He plans to infect every living person with the zombie virus. Those who survive the bite are deemed worthy of survival and those who become zombies are said to be blessed to be free of suffering and pain. Basically, this guy is NUTS. I absolutely loved this book. It is the first book in a trilogy by Ryan Hill. What I liked most about this book is that it is different. Yes, there is the typical guy trying to save his girl storyline, but that is only part of the plot. I loved the fact that Ryan Hill has decided to include characters who somehow survive being bitten by zombies. You have to think that if zombies ever actually existed, then at least some people would survive a bite. It stretches reality to think that any virus would have a 100% infection rate. I loved Ambrose’s character. He starts off as the perfect guy. He is young. He is brave. He is loyal and attractive. What more could anyone ask for in either a friend or a lover? I think I had a little bit of a “book boyfriend crush” on him right from the beginning of the book. When he is bitten by the zombie and becomes a hybrid, he is shunned by his fellow soldiers despite the fact that he is still the same guy they had all loved previously. Ambrose handles their rejection with poise and class. He does not allow himself to be drawn into their juvenile behavior which makes readers like and respect him even more. Ryan Hill has perfected the art of character building and also does an incredible job of world building. I have read A LOT of zombie books and for that reason it is rare that I rate any of them higher than 4 out of 5 stars. 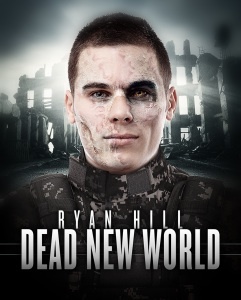 However, DEAD NEW WORLD deserves it’s 5 star rating and I am now a fan of Ryan Hill. This is the second book in Elaine Bertolotti’s … And Me series. 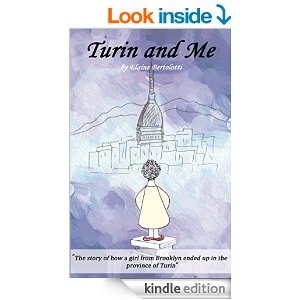 It is the story of an American girl from Brooklyn living in the province of Turin, Italy. The first book in the series was the story of Elaine’s time living in Florence. In this book she is married and living in the town of Almese in the region of Piedmont in the province of Turin. After leaving Florence to return to the United States, she spent two years back in the States before the irresistible urge to return to Italy overcame her. Piedmont is the second largest region in Italy, with Sicily being the largest. 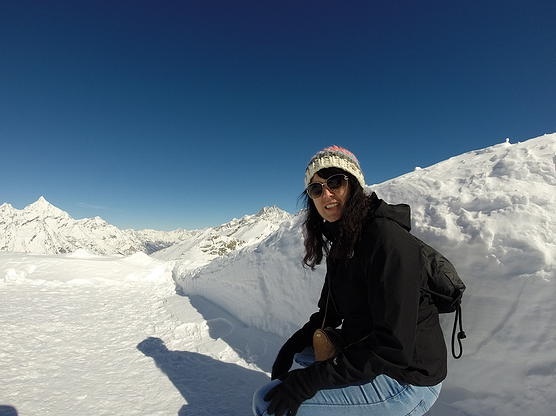 It is surrounded on three sides by the Alps and Monte Rosa and borders France and Switzerland. The capitol city is Turin. 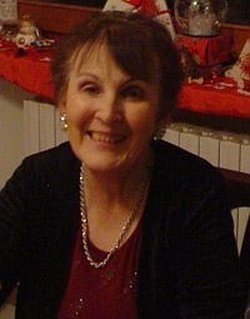 Even though Elaine had learned to speak Italian while living in Florence, she discovered that different regions of Italy had their own dialects and once again she had to learn a new way of speaking. Her husband is a native if Italy, but he comes from a different region, so the local dialect was new to him as well. Since the couple decided to settle in a small town, it was inevitable that she would become well known. In fact, all the town residents simply referred to her as The Americana. Once Elaine enrolled her daughter in the local nursery school and the local residents learned that her grandparents were born in Italy they started to accept her. She goes on to describe many aspects of her life which are sure to make readers wish they could move there themselves. Elaine should receive kickbacks from the Italian Tourism Board since her writing is sure to bring tourists to their country. The book includes many humorous anecdotes which are destined to elicit chuckles from readers. I rate this book as 4 out of 5 stars and am looking forward to reading the next book in the series. Elaine Bertolotti was born and raised in Brooklyn, New York. Her grandparents had been born in Italy and it was this connection that drew her to want to live in Italy. Amelia’s mother died a few years prior to 1842 in a riding accident when she was thrown from her horse when it was spooked by a snake. Recently her father fell ill and after a valiant fight, he succumbed to his illness, leaving Amelia an orphan at the age of 19. Amelia’s Uncle Lewis insists on taking Amelia to America to live. This devastates her. She has no desire to leave her beloved London townhouse or her country estate. But the law states that she has no say in the matter. Amelia decides that they only way to avoid being forced to spend the next two years in America is to find an English husband. She convinces her Uncle to give her four weeks to accomplish her goal and sets out to find a suitable marriage partner. But, as they say, the best laid plans never come to fruition in the way a person expects. This certainly holds true for Amelia. This book also highlights how much society has changed in the past 150 years. In 1842 women had very few rights. This is highlighted by the fact that Amelia has to do whatever her guardian says unless she marries or turns twenty-one. If Amelia were to marry, she would then be at the mercy of her husband’s whims. I enjoyed this book and I came to like and respect the character of Amelia. She is not the typical whiny, helpless woman that most books set in this time period portray. Amelia is strong-willed, intelligent and determined. Author: Lawrence W. Gold, M.D. Firstly, I want to mention that although this is Book Seven of the Brier Hospital series, I have not read any of the previous six books in the series. In fact, this is a stand-alone novel and it is not necessary to read the previous books to either enjoy or to understand this book. Now, with that being said, I enjoyed this book immensely and I do plan to read the author’s other books. Denise Berg, a professor of psychology, and her husband Gabe, a molecular biologist wanted badly to have a child. Unable to conceive on their own, they turned to fertility treatments. After many failed attempts, they were thrilled when Denise finally became pregnant. Because of the intelligence of both parents, they expected their child to be smart. They just didn’t expect him to be extraordinary. They name their child Zack and this book chronicles his life into his teenage years. He is gifted both physically and mentally. In fact, he has a genius IQ. Denise has Basque heritage and Zack becomes curious about that part of his lineage. Because of Zack’s abilities he attracts the interest of many people. Some of them have less than noble plans for Zack. Professor Jorge Moneo grew up in Basque Country, a place of violent confrontation between Spain and the Basque people’s struggle for independence. Spanish security forces murdered his parents, his grandmother, his wife and his only son. Jorge had been a happy and reasonably content man until the day his family was brutally murdered. The motive for the murders was the simple fact that they were Basque. As of that day Jorge swears that he will get revenge. He attacks one of the murderers in the street but is unable to kill him. The Spanish authorities suspect that he is the attacker, but without proof they are unable to prosecute him. Instead, they deport him to the United States and warn him to never return. Jorge may not be able to do anything about the murders at the time, but he begins plotting his revenge. Once he settles in the United States he opens a school for gifted children with Basque bloodlines. It is at this school where he meets Zack. The teenager and the Basque revolutionary become inextricably linked and the lives of both of them will never be the same. The author has woven an intricate and interesting tale of a family struggling to raise a gifted child with a political thriller and a medical thriller that is reminiscent of Robin Cook’s writing. This book is a truly unique experience. Even if the Basque element was removed from this story, it would still be an interesting book. Zack’s parents want what is best for him. How do you balance a supreme intellect with regular childhood? They want to challenge him, both physically and mentally, but they also want him to just “be a regular kid.” They want him to enjoy his childhood and not to ignore the value of regular experiences such as playing with kids his own age. Add in the political issues of Basque independence and the medical issues around superior DNA and you have an excellent story. Because this book is so complex and contains so many different threads, I am sure that my review is not doing it justice. However, I highly recommend this audiobook. The narrator, Joe Hempel, has a great voice. His pacing was perfect and the way he narrates allows the listener to be pulled into the story. I listen to A LOT of audiobooks and there are a lot of different narrators. I find that if I don’t like the narrator’s voice then I end up not liking the book. Joe Hempel does a wonderful job of narrating HYBRID. Lawrence W. Gold was born in Brooklyn and attended medical school in Chicago. The war in Vietnam interrupted his medical training, but he returned to the United States in 1968 to complete his training in internal medicine and nephrology. He spent twenty-three years in Berkeley, California in a hospital-based practice caring for patients with complicated illnesses often in ICU, and served as Chief of Internal Medicine and Family Practice. 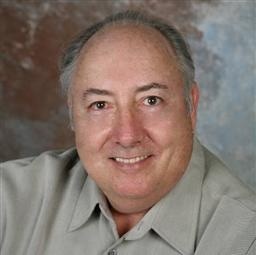 Joe Hempel is a book reviewer who has broken into the publishing scene with audiobook narration, voice acting, and eBook editing and formatting. FANTASY OF FLIGHT picks up where FANTASY OF FROST left off. In the first book readers are introduced to the two distinct countries that make up Olina’s world. There is the country of Solati which is hot and the country of Glacium which is cold. That is an oversimplified explanation, but readers will know the differences from the first book and I do not want to repeat them in this review. Throughout book one Olina wore a veil. She had never taken it off and had never even seen her own face. At the end of Book One she musters the courage to remove the veil and discovers the reason her mother kept Olina’s face covered throughout her entire life. Olina has blue eyes. Why is this a big deal? Well, only people from Glacium have blue eyes and Olina is destined to rule Solati as the Tatum. Solati citizens would never follow a leader with blue eyes. Olina was being held in the palace of Glacium but escaped by removing her veil. Since no one knows about her blue eyes, exposing her face is the best way to blend in with Glacium’s populace. While escaping she meets Alzona, the owner of a fighting compound, and follows her to her fortress. Olina plans to earn money by fighting for Alzona. Olina is searching for the source of the Seedyr wood arrows that killed Prince Kedrick; the man she loved. She needs to discover who killed him and why and she knew that she would never be able to achieve that goal while living at Glacium’s palace. The descriptions of the other fighters and the friendships that develop are perfect. Olina as Frost is written with superb skill. I do not want to give away too much of the story, but suffice it to say that Kelly St. Clare has once again created a book that appeals to a wide range of readers. This is only her second novel, but the skill she demonstrates in storytelling will have readers believing she has been writing books for decades. Her characters are vivid and believable and readers cannot help but be drawn into the story. The setting is unique and the details of the two worlds bring them to life with a detail that is unlikely to be rivaled by any but the very best authors. The juxtaposition of the two world being almost exact opposites while being codependent on each other is an intriguing twist. There are just enough details to make these worlds come to life without being so detailed that the writing becomes mired down in descriptions. Olina is a strong female lead and she shows a maturity beyond her years, while at the same time still occasionally displaying the immaturity expected of a sheltered eighteen year old. The author has done a magnificent job of maintaining that delicate balance. Kelly St. Clare has quickly become one of my favorite authors and I am now a fan for life. I am looking forward to her next book. 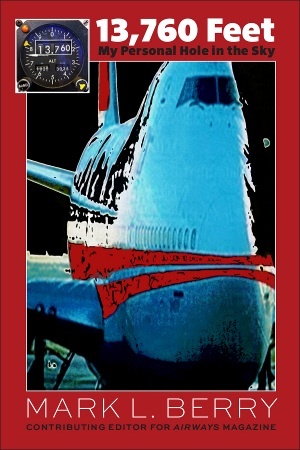 If you want to read a story that you will be unable to put down, FANTASY OF FLIGHT is that story. 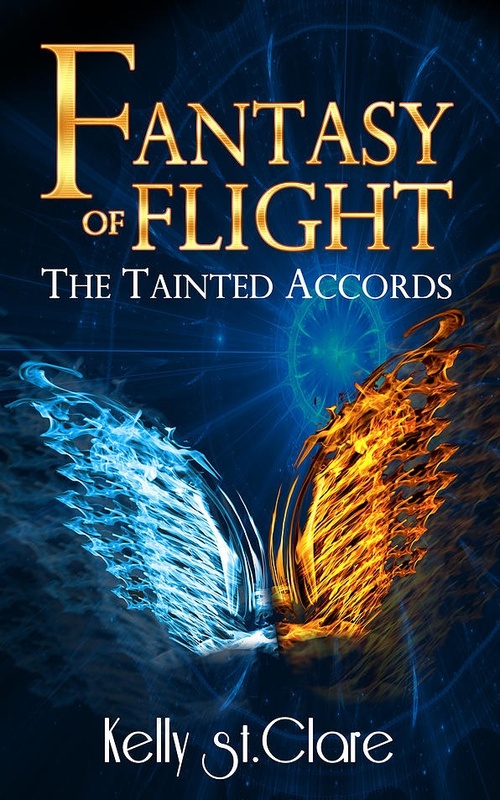 FANTASY OF FIRE – The third book in The Tainted Accords series is set to be released in January 2016 and I will be eagerly awaiting it’s release. My advice: BUY THIS BOOK! You will not regret it! 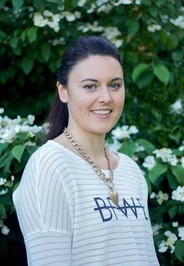 Kelly is originally from New Zealand and now lives in Australia with her soon-to-be husband. Kelly’s goal is to write books that she would want to read. 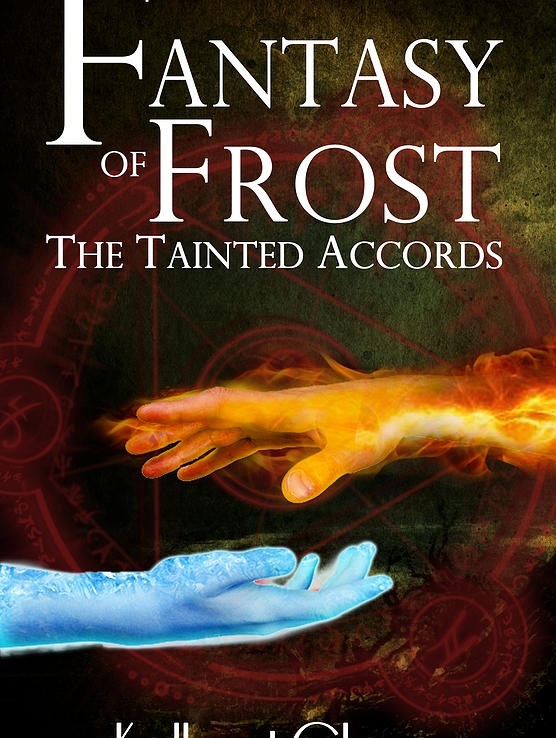 Fantasy of Frost is Book One of The Tainted Accords series. A picture of the author on a beautiful sunny day in Glacium.